Through a cheap set-top box or a simple PC software client, OnLive streaming games can deliver the latest system-melting titles to crappy hardware you already have. The service's secret? Cloud rendering. 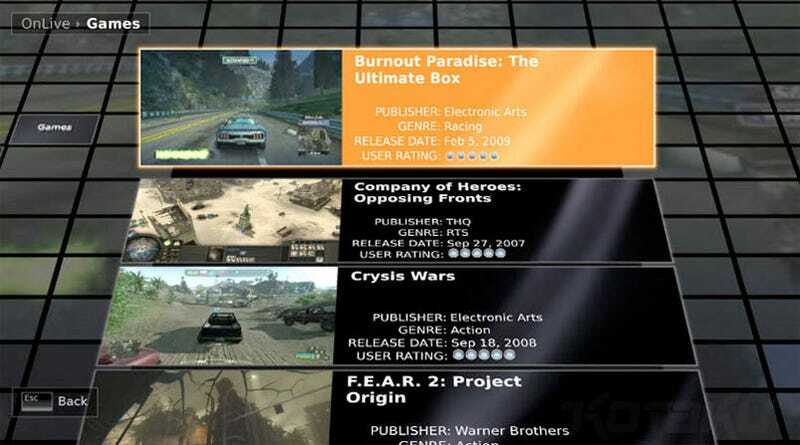 In a nutshell: OnLive runs the games on their powerful servers, the output is then rendered as a video stream and then sent to your OnLive set-top box, PC or even netbook, taking expensive, loud, obsolescence-prone gaming PCs out of the picture entirely. 720p HD streams are said to be possible over a 5mbps connection, while SD gaming only calls for a 1.5mbps line. Hardware requirements are virtually nonexistent, meaning that you can play, say, Crysis, on anything from your MacBook to your Aspire One to your Dell Studio to your eMachines shitbox. If you want to hook the service up to a TV, OnLive will sell you a set-top box for "less than a Wii", which shoulders just enough of a load to play back OnLive's HD streams. The service itself will likely operate on a subscription model, but OnLive hasn't given any firm details on how much that'll cost. And before your ask, publishers are already on board, including EA, THQ, Ubisoft, and Epic. Really. To anyone who has heard of LivePlace—the eye-popping server-rendered Second Life clone for mobile phones—this will all sound familiar, and the same concern will immediately bubble up: lag. If it's plagued client-rendered multiplayer games for all this time, how could OnLive possibly avoid it with such dramatically increased demands on user bandwidth? Well, Kotaku got to try the service, and though it was only hosting a fraction of the users it will when it goes public, they were able to play Crysis Wars without a hitch. OnLive is set for launch later this year, and we'll get to see how the service scales when the beta opens up in this summer, and if their unbelievable 1ms video enocoding claims hold any water.